"Those who know Notre Dame, no explanation is necessary. Those who don't, no explanation will suffice." Justin Brent, current 4-star Irish commit, and future Notre Dame star. After impressing those at the Rivals camp, and before heading to Oregon for ESPN’s The Opening, Notre Dame in-state commit, Justin Brent, took time out of his busy schedule to answer some questions for the Gold and Blues Brothers. 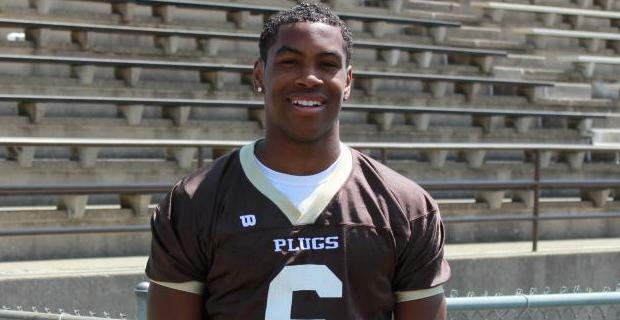 Check out what this 4-star wide receiver, and future Notre Dame star, had to say. Jake: Right off the bat, you committed to Notre Dame. What was so special about the University that made you pull the trigger so quickly? Justin: Well, as you know, I committed before a lot kids. I took camp visits to Louisville, Notre Dame, Ohio State, and was planning to head to Cincinnati after that. I had one-on-ones with each head coach and actually ended up committing the day of leaving the Ohio State camp. Basically, Notre Dame felt like the school I already go to, so it was easy to call it home. Reminded me a lot of Speedway, actually. Jake: Nothing better than committing to Notre Dame after just visiting Ohio State! Justin: Haha, exactly! I’m a huge Tim Tebow fan, so everyone expected the opposite. Fritz: Yeah, it’s hard not to like Tebow … great representative of faith. So, despite ending the recruiting process early, what were your best and worst experiences during the entire process? Justin: I’d have to say the worst experiences happen once you commit and you have to tell all of the other colleges that you’re not interested. That’s definitely the toughest. One of the coolest parts, though, is when you’re in class and you step out into the hallway and a D1 coach is right there trying to recruit you to their school. Justin: Oh definitely! And Notre Dame was the first to do everything. They were the first to visit me, first place I signed an autograph, first college football game, all that! Jake: So, did you have any second thoughts on getting a Notre Dame tattoo before even signing your letter of intent? Justin: Haha, not at all! You think about it, but at the end of the day, I’m going to Notre Dame for more than football. It’s more about the degree coming out. There’s really not a better place in the country, so there’s truly no reason for me to decommit. Plus, it’s designed to be able to get filled in if need-be, haha. Jake: Well, hopefully that need never arises! Fritz: Smart man … commit to the school rather than other things. So, how much did the in-state location have to do with your commitment to ND? Justin: Another huge factor, for sure. To be able to head home whenever I need to or be able to have people visit was very important – for my mom, as well as for me. Her and my little sister will have the toughest time when it’s time for me to leave. It’s just a blessing because Notre Dame is very straight forward when saying they want the best player in Indiana. And they felt that that was me before everyone else started to see the same. Fritz: Yeah, they seem to do well recruiting in-state talent: you, Jaylon, Kiel, Day, etc. Jake: That first year away is always the toughest. But, if you stick it through, the reward after the 4-year degree will be well worth it for you and your family. Jake: On your trips to ND, who have you created the strongest bond with? Justin: I mean, besides the coaching staff and a lot of the 2013 guys, since I was the second commit, they were the only people I could get to know early on. The strongest bond had to be with Elijah Hood, though, and it wasn’t from being on campus either. We actually roomed together in Chicago at the Rivals Top 100 5 Star Challenge. Definitely became close there. Jake: Yeah, he mentioned that. Said you were going to be a freak for ND! Justin: Hahaha, I appreciate that! Fritz: Are there any professional players you would say your game is comparable to? Justin: I mean, I’d love to leave that to other people to compare. But, I do train with Tandon Doss from the Baltimore Ravens, and we have become like brothers over the past two years. Fritz: Always good when you can train with an NFLer. Justin: Yeah, he’s a very cool guy. 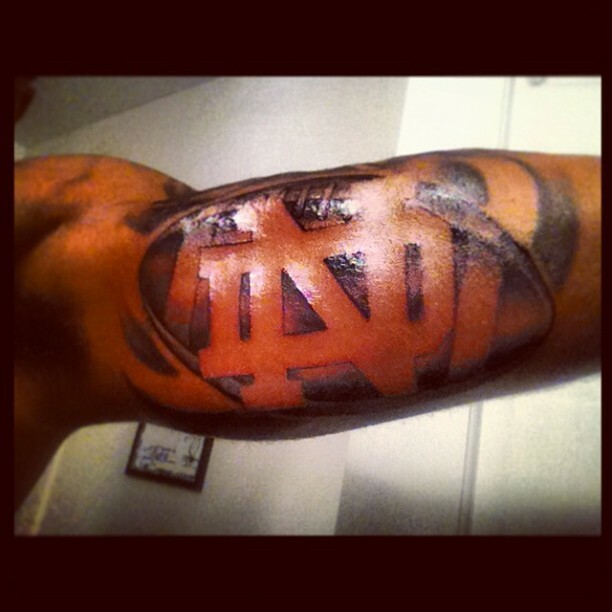 His tattoo artist actually did the Notre Dame tattoo we were talking about. Jake: Nice! Also good when you can blaze your own trail. We want a Justin Brent at ND … not someone we’ve already had. Justin: I definitely agree with that! Jake: What are you most looking forward to about going to The Opening in Oregon? Justin: I mean, it’s just like the Rivals camp: just having fun with the guys. No pressure since I’m already committed. Jake: Just living the life! No cares in the world … just traveling to the west coast for some pickup ball. No big deal! Fritz: Exciting to be on ESPN, I’m sure. Justin: Haha, it definitely comes with it. Just another way for people in Indiana and Notre Dame fans to see. Fritz: Do you get involved much in the recruiting process, or just let the coaches handle it? Justin: I really don’t. I don’t think I’m good at it, so I try to stay out. I leave it up to Elijah. He’s been very successful when it comes to that. Jake: No joke. He’s all over that twitter! Fritz: That is understandable. We have a great coaching staff that does a terrific job recruiting. By the way, I just checked out Doss’s IU tattoo. Pretty awesome! That artist does a great job! Justin: Yeah, I’d honestly say he’s the best in Indianapolis, if not all of Indiana. Jake: Alright, this question is two-part. What sort of legacy do you expect the Golden Army to leave upon graduating ND? And do you have any personal goals while there? Justin: I mean, I really couldn’t tell you, but I feel as good as the 2013 class. We’ve done a really good job coming after that. And, I really only have one goal besides getting better every day and keeping the same work ethic. When it comes to my freshman year, I hope to get into the rotation somehow. I know it’s tough to start your freshman year, but I feel getting into the rotation should be my ultimate goal first and foremost. Fritz: Well, if you impress the coaches like you impressed those at the Rivals camp, that won’t be a problem. Jake: Great goal, man. Seems like you’re a driven guy … it’s going to take a lot of drive and dedication to get on the field. But, I’m telling you, man, from what I’ve seen, you’re certainly capable! Justin: Hey, that’s what I’m working toward. Fritz: So, are you playing basketball next year? And chance you’ve spoken with Coach Brey about playing basketball at Notre Dame? Justin: I came to the conclusion that I probably won’t be playing basketball next year. It was tough during the spring, because while I had to train and get ready for the summer circuit and basketball, I was also having workouts. It was tough juggling everything. So, it kind of put me in a bad situation as far as playing for next season. And as far as basketball goes at Notre Dame, before I decided not to play, they were actually considering me. So, I mean, that’s something that might be talked about when I get there. But as of right now? No. Jake: It’s certainly possible, but I completely understand focusing on just one sport. Imagine how much greater you’ll become when you’re practicing and working out for only one. Justin: Exactly. That went into the decision, as well. Justin: Just can’t wait to get there, compete, and get better with the guys every day. I’m excited to be a part of ND Nation! Jake: Well, I think I speak on behalf of Irish fans everywhere when I say we’re excited to have you, too. Thanks again for the interview! This entry was posted in Uncategorized by goldandbluesbrothers. Bookmark the permalink.